Reverend Dr William Barber of Birmingham, Alabama, has spoken of the need for a “breakthrough” in the civil rights movement in the US, citing an acceptable development being a point where “every poor person has a guaranteed income”. 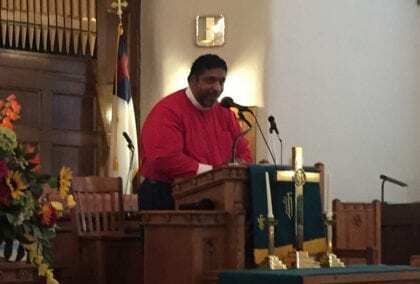 During his tour across 14 states, Rev Barber talked of the need for a “moral revival across the US”, and hoped that the content of his talks would lay the foundation for a new ‘Poor People’s Campaign’ – a 1968 campaign which attempted to push Congress into passing an economic bill of rights including a package of equitable funding, funds for poor communities and a guaranteed income. Though one’s interpretation of a “guaranteed income” can differ significantly from a Universal Basic Income (UBI), given the context of Rev Barber’s comments in referring to the Civil Rights movement in the 1960s and therefore to Reverend Dr Martin Luther King Junior’s repeated reference to “guaranteed income” in speeches and writings at the time, the form of “guaranteed income” being referred to would seem to share many qualities with the standard conceptions of a UBI. In his book published in 1967, ‘Where Do We Go From Here: Chaos or Community’, Dr King dedicated a whole section in Chapter 5 (titled ‘Where Do We Go’) to his idea of why a “guaranteed income” was necessary, and what it would look like. The premise of his discussion was based on the need, as he saw it, to abolish poverty on the grounds that “if democracy is to have breadth of meaning, it is necessary to adjust this inequity. It is not only moral, but it is also intelligent. We are wasting and degrading human life by clinging to archaic thinking”. Though he accepted that the causes of this poverty are the indirect consequence of multiple social evils – limited educational opportunities; poor housing; fragile family relationships – Dr King said that the solution could not also be indirect, since in order to be effective the programs required to improve those situations sufficiently would have to be coordinated and comprehensive, which, to date, has never been the case. In addition, he stated “that no matter how dynamically the economy develops and expands it does not eliminate all poverty”. His conclusion, therefore, was that the simplest approach to the issue was also the most effective, which was to provide people with a direct guaranteed income. Other than a guaranteed income being a way of addressing the moral quandary we face as a society, Dr King pointed out that “we are likely to find that the problems of housing and education, instead of proceeding the elimination of poverty, will themselves be affected if poverty is first abolished”. He also talked about the psychological benefits to the measure, including a flourishing of individual dignity, the ability for people to seek self-improvement, and a reduction in the friction experienced in personal relations “when the unjust measurement of human worth on a scale of dollars is eliminated”. Dr King did expand on the specifics of what such a program should look like, stating two key conditions he deemed indispensable in ensuring that the guaranteed income remained a progressive measure. The first of these was that a guaranteed income should be pegged to the medium income of the society in order to avoid perpetuating welfare standards. The second was that the level of the income should be dynamic, such that if the income of society grows so does the payment. This latter measure would be necessary to avoid the system becoming regressive. One significant problem: Years of work have gone into pitting the middle class against the poor, and pitting the poor against each other by race. In a nutshell, this is how the “corporate state” divided, subdivided, and conquered the masses. While people of color are disproportionately poor, the great majority of US poor are white. Why today’s US has such deep poverty isn’t a mystery. In real life, not everyone can work (health, etc.) and jobs are not available for all. We have a significantly flawed “free market” capitalism that leaves many behind. The US began shipping out jobs in the 1980s, ended actual welfare aid in the 1990s — lost over 5 million manufacturing jobs alone since 2000. The last I heard, there were only 7 jobs for every 10 jobless people who still have the means to pursue one (home address, phone, etc.). What do people think happens to those who are phased out of the job market today?